One of the most common things travelers want to know is how they can see more wild animals. Most animals rest in the middle of the day, so you've got to be out early in the morning and late in the evening. Take your time. It's hard to spot animals when you're traveling at 55 mph. You can't spot animals in thick brush, so get out of your car at viewpoints or make sure your trip includes some high, alpine country where you can see with binoculars for many miles. Which brings up the point that you need binoculars. It helps to be comfortable. Take along a folding chair or stool. Guides and guided trips can't guarantee wild animals, but guides know when, where and how to spot them. Your chances of seeing wildlife while in Denali National Park are very high. But this isn't because there are more animals there. It is a combination of the open country and the animals not being pursued. You have only a 25% to 30% chance of seeing the mountain on a trip to Denali National Park -- but a 95% chance of viewing a bear here. The photo shows a Denali Park moose. 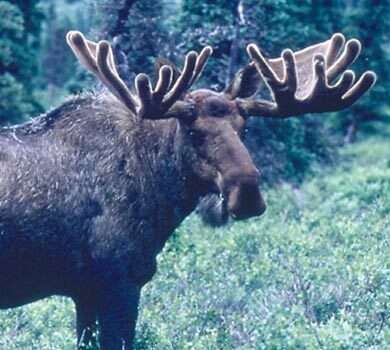 Around 1,800 to 2,000 moose live in Denali National Park, mostly in forested areas. You rarely see a moose above the tree line. Good spots to view moose are from the park entrance to Mile 12, and in the Teklanika-Igloo area. You can sometimes even see moose near park headquarters. Biologists say moose densities are lower within the park itself than outside of Denali. 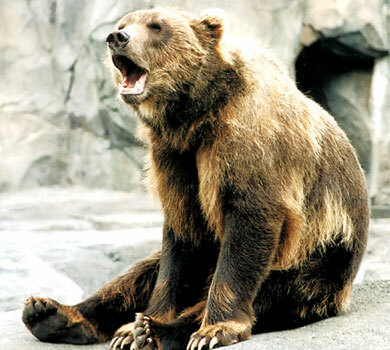 Brown bears are found throughout Alaska. Alaskans use the term "brown bear" when they're talking about larger salmon-fed bears along the coasts. 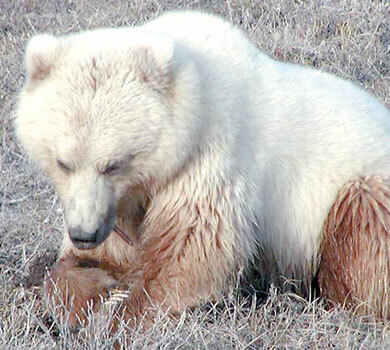 "Grizzlies" are brown bears found in Interior Alaska. 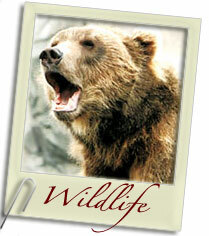 The brown bear has a shoulder hump, rounder ears, and longer, straighter claws than a black bear. Its fur can be blond to dark brown. It has a flatter, broader face than a black bear. And it's big. Brown bears weigh from 300 to 900 lbs. When brown bears stand upright it is to get a better view -- not to charge. But speaking of that, if you are charged, don't run. Experts say to lie face down, protect your head, and play dead. Moose are easier to see in Anchorage than in Denali National Park. In the summer, walk or bike on the the coastal trail between Point Woronzof and Kincaid Park. Moose are dense here because the airport has a fence to keep them off the runway. They tend to bunch up when they wander up the fence. In the fall, you can see bulls fight in Upper Campbell Creek at the Glenn Alps viewing platform. There are 5 packs of wolves in Greater Anchorage, with two in the Anchorage Bowl. The five packs are: Ship Creek Pack; Elmendorf/Fort Richardson Pack; Eklutna Pack; Girdwood Pack and Portage (or Twenty Mile) Pack. 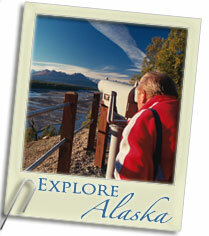 See them at the Eagle River Nature Center, Westchester Lagoon and Campbell Creek. 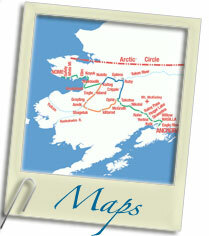 They come down to the Seward Highway near Beluga and Windy Points (Mile 108, where you can see Beluga whales, too). Go birdwatching at Potter Marsh, Westchester Lagoon, and along the coastal trail. Ravens play inthe north wind at Point Woronzof and owls can be seen in Kincaid Park. 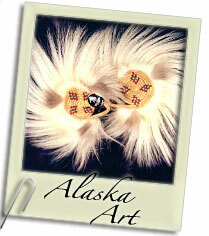 For more information, go the Alaska Department of Fish & Game's excellent website, www.wildlife.alaska.gov. The information here was gathered from a winter lecture series, "Wildlife Wednesdays," at the Loussac Public Library in Anchorage. 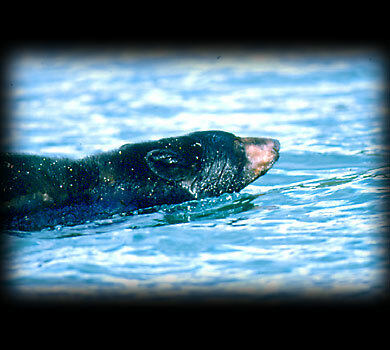 North America's smallest bear is the black bear. "Small" is a relative term, because black bears can easily weigh 200 lbs. Despite their name, their color is not always black. In Southcentral Alaska, you often see a brown or "cinnamon" bear. Black bears have a straight, dog-like nose. In fact, when seen crossing a road from far away, they can be mistaken for a large, black dog. Even though they aren't as big as a brown bear, black bears can be very dangerous. 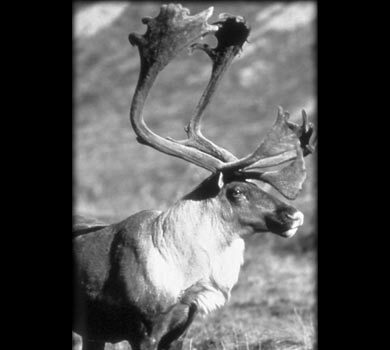 The Denali caribou herd stays mainly in Denali National Park, though it occasionally wanders out. 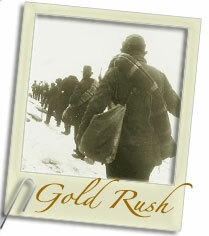 In the early mid-1900's there were around 20,000 animals in this herd, which stabilized to 1,800 to 2,000 caribou. Denali Caribou winter at Stampede Flats and west of the visitor center. They calve at the end of the park road, up in the mountains. Foxes travel up and down the road system in Denali Park, scavenging for road kill. These two photos were taken a decade apart. You'll find arctic ground squirrels, snowshoe hares, and foxes of all shades, from black to bright red. Dall sheep are near Mt. Healy and Savage River. 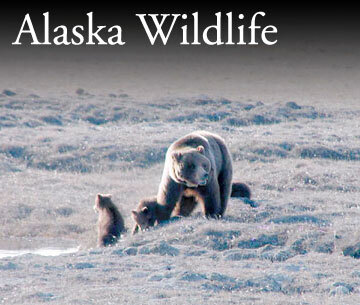 Information on wildlife viewing, hunting and trapping, and wildlife refuges and sanctuaries in Alaska.